If you are interested in competing in any of the following events please email our Board and Ski Captain. Surf Race – the Surf Race involves swimmers starting on the beach and then running, wading and swimming about 170metres to sea to round as set of buoys and then return to the beach. The event concludes with a run finish to the flags placed on the beach. 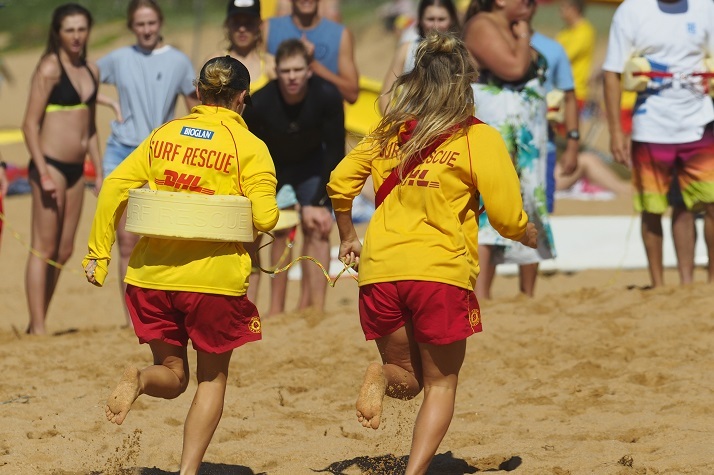 Belt Race – the Surf Belt race involves the use of the surf reel, line and belt and is one of the most prestigious and traditional races in surf lifesaving competition. The event begins on the beach with the swimmer placing the belt around their waist and towing a surf line out to their allocated buoy and signalling their finish. The Belt swimmer is assisted by three linesmen and a reel handler. Rescue Tube Rescue race – the rescue tube rescue event features four team members: a patient, a rescue tube swimmer and two rescuers/assisters. The event commences with the patient swimming to their allocated buoy and signalling back to the beach. The rescue tube swimmer then swims to rescue the patient with the assistance of swimming fins and a rescue tube. Upon arrival at the buoy the rescue tube swimmer harnesses the patient into the tubes and swims back to the beach. As the rescue tube swimmer and patient approach the shore the two rescuers enter the water to assist in getting the patient across the finish line. Rescue Tube Race (two person) – the two person rescue tube race is similar to the 4 person rescue tube rescue race except without the assistance of the two rescuers. The patient swims out to the buoy, signals the rescue tube swimmer who then swims out (with the assistance of fins), collects the patient and swim them back to the finish line on the beach. Rescue Tube Race – the rescue tube race is contested on the same course as the surf belt race. When the race commences the competitors must run up the beach to collect their rescue tube, turn and race to the water and swim to their allocated buoy to signal their finish of the race. Run-Swim-Run – this event is run across a normal swimming course with the competitors commencing the race by running approximately 200metres to round a flag on the beach before embarking on a swim around a set of buoys and then back to the beach. Once the competitors complete the swim leg they must then run around the same flag as the start of the race and sprint to the finish. Wading Race – the wade race is a popular amongst younger athletes and involves running out to an allocated a turning mark at knee depth water and then the competitors may either wade, dive or swim along the beach to another marker before returning to the beach to run to the finish line. Wading Relay – the wading relay is a four person event where competitors complete the wade race one at a time and tag the next person who then continues on. The race is completed once the fourth and final team member finishes the wading course and runs up the beach to the finish line. Surf, run-swim-run and the wading races are direct tests of physical ability in and around the surf environment, whereas the Belt, Rescue Tube Rescue and the Rescue Tube races are “simulated” races. Double surf ski race – from a floating start, competitors (two per ski) paddle their ski around three buoys and return to the finish line. The finish is judged when any part of the ski crosses the finish line with both team members and at least one paddle in contact with the ski. Surf board race – from the beach (standing start) each competitor enters the water with their surf board, paddles around all buoys and returns to the beach. The winner is judged by the first competitor to cross the finish line on their feet and in contact with their board. Ironman/IronwomanThe Ironman and Ironwoman events are conducted over a course consisting of three legs, including a swim, surf ski and surf board. The race concludes with a beach sprint to the finish line. The order of the legs may vary and is decided by draw prior to the event. Taplin Relay – Teams of swimmers, board paddlers and ski paddlers, compete together as a team relay over an Ironman course. The order of the legs may vary and is decided by draw prior to the event. The Taplin Relay event may be conducted in three person (one swimmer, one surf board and one surf ski paddler), six person (two competitors for each water leg), or four person (one competitor per water leg plus a beach sprinter to complete the race) variations. Surf Board Rescue Race – This two-person event comprises of a surf swimmer and a surf board paddler. The race commences with the swimmer swimming to their allocated buoy and then signalling back to the beach for their board paddler to come out and collect them. Once the paddler reaches the swimmer, the two paddle their board back to beach and cross the finish line.